Every woman should own a pair or real pearl earrings because they are the ultimate sophistication and one of the most delicate symbols of femininity. Nowadays, the jewelry market is flooded by cheap artificial pearls, but these always fall short of the impeccable standard attained by real pearls. Real pearls are well worth the investment because, unlike their artificial lookalikes, they will pass the test of time. Pearls are forever because they will remain just as beautiful throughout the years. They can be passed on from one generation to another and they will never fail to impress because their main features will be naturally preserved. As for the investment you need to make for a pair of real pearl earrings, it may not be as sizable as you might think. The impressive development of the jewelry market has brought about a technological revolution in the pearl collection and culturing industry. Thus, the market for real pearls has expanded significantly, which has made these organic gems affordable to a wide range of buyers. Real pearl earrings are luxury items because of their flawless reputation and their high standard of quality. But in this day and age, they are a luxury that any woman can indulge in. Let us tell you a bit about the most affordable types of genuine pearls you can find on the market so that you can get an idea of the impressive amount of options you have. Beyond any doubt, freshwater pearls are the most affordable type of genuine pearls you can find in the jewelry market. You can get real freshwater pearl earrings for as little as $35.00 and they will look anything but cheap. Freshwater pearls are perfectly suited for culturing, and their production process has boomed over the past few years. And with the optimization of the culturing process came an important increase in the quality of freshwater pearls. While they do not excel in size, these pearls have an impeccable luster and they come in an impressive variety of colors, ranging from perfect whites to delicate pinks, elegant lavenders, and mystic blacks. The vast majority of baroque pearls on the jewelry market are freshwater pearls and they are absolutely stunning. They have uneven shapes and sizes which make their price drop significantly because they fall short of the round pearl standard. The baroque category includes coin pearls, rice pearls, heart-shaped pearls, egg pearls, Keshi pearls, and many other outstanding pearls. These are perfectly suited for creative pearl jewelry. Explore the market to find some breathtakingly beautiful freshwater real pearl earrings that are guaranteed to catch anybody’s eye. You can find real pearl stud earrings with either round freshwater pearls or baroque pearls. These statement accessories are extremely delicate and they will add a touch of elegance to any outfit. Cluster real pearl earrings are made with either small round freshwater pearls or baroque pearls. They are both elegant and daring, which makes them key accessories that any woman should have in her jewelry box. Dangle real pear earrings are statement items that will add a touch of sophistication to any outfit they are paired with. You can opt for single-pearl models for a classic look or you can explore the impressive range of multi-pearl items for a more daring look. Japanese Akoya pearls take the classic white round pearl look to an entirely new level of excellence. So if you are in the market for white pearls, then look no further because Akoya pearls are the best ones you will find. Their superior luster and thick nacres make them the best white pearls out there. 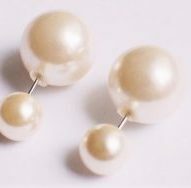 And you can get Japanese Akoya real pearl earrings for less than $100.00, which makes these true must-have items. If you are willing to spend up to $500.00, you can buy 8.5-9mm Hanadama-AAAA Japanese Akoya pearls, which are absolutely stunning. Tahitian pearls are the most valued black pearls on the jewelry market. They come in a generous range of intense shades of black which is significantly intensified by their stunning metallic overtones. Tahitian real pearl earrings prices start from $259.00 for a pair of genuine Tahitian pearl stud earrings. If you are willing to spend over $400.00, you will find an impressive array of options for stud earrings, as well as Tahitian pearl and white gold dangle earrings. These excellent pieces are true luxury items because they rise up to the highest standards of the jewelry market. As we have mentioned above, round white pearls are the standard in the pearl series. White South Sea pearls come in sizes up to 13mm, which makes them some of the most valuable items on the market. For less than $600.00, you can get a pair of 10-11mm AAA White South Sea real pearl earrings, which are absolutely stunning. Explore the jewelry market to find some truly breathtaking pieces that you will simply fall in love with. We hope we have managed to give you an idea of the variety of real pearl jewelry you can find at fairly reasonable prices. Explore the market to find some amazing real pearl earrings and necklace sets, as well as elegant real pearl bracelets and you will be surprised by just how affordable they can be. Pearls are always a solid investment because their remarkable features will stand the test of time and you will be able to cherish them forever.